‘Bobby Cinema 20 Movie and TV Show Plot Summary Ideas!’ features various thoughts for film, TV. Bobby Cinema has written 20 movie screenplays, but because film studios don’t take unsolicited material, he’s spent eight years trying to sell his screenplays with no success. 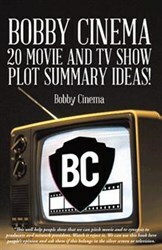 In an effort to garner the people’s opinion on whether or not his ideas belong on television or the silver screen, he releases his new book “Bobby Cinema 20 Movie and TV Show Plot Summary Ideas!” (published by Trafford Publishing). Bobby Cinema lives in Maryville, Mo. His family is from India and he is the first member of his family who was born in the United States. He dedicates this book to his niece, Lakeh. Sylvester Stallone is his hero because he, too, was an aspiring screenwriter who faced difficulties getting his idea into film when he wrote “Rocky.” This is Cinema’s first published work.